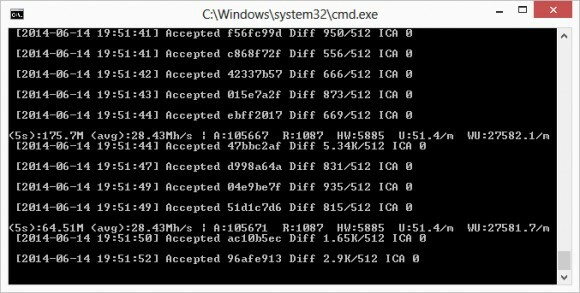 Our testing of the 27 MHS GAWMiners Falcon Scrypt ASIC continues and in the last few days we’ve been moving the ASIC miner through different pools in order to check what is the actual performance that you can expect from it. If judging the performance based on what cgminer reports you should be looking at the WU reported speed as the actual one and not the one for the last 5 seconds or the average reported by the software. Though do note that the WU reported speed is for the last minute based on the shares submitted. To get a more accurate result we need an average that covers longer period of time such as an hour or even a day and you can easily get such results from a pool monitoring and reporting not only your current hashrate again based on the shares submitted in the last minute for example. Do note that the Falcon Scrypt ASIC from GAWMiners is essentially the same in terms of hardware inside as the ZeusMiner THUNDER X3 and should produce the same hashrate. So far the recommended operating frequency of 328 MHz seems to work very well, though the standard rating of the ZeusMiner ASIC chips seems to be 300 MHz. The results you see here are made using the 328 MHz operating frequency with a HW error rate hovering around 5%, slightly higher than we would want, but still acceptable and apparently the normal one for the Zeus chips. Here you can see a 24 hour chart with the hashrate reported by the LTC Rabbit mining pool. The minimum average hashrate per hour we got at the pool for the 24 hour test period was 25674 KHS and the maximum was 29332 KHS with an average across the 24 hour period of 27882 KHS. A very good result and with that hashrate you can currently get about 2.5-2.6 LTC mined a day, not too bad with the difficulty recently going past 10 thousand, but not that great either with the current exchange rate for Litecoin. So mining LTC now and not selling it immediately seems like the smarter choice if you have decided to invest in larger Scrypt ASIC miner such as the GAW Falcon. Trying out the Scrypt ASIC miner at the ScryptGuild mining pool where you mine altcoins and get payed in BTC has shown us very similar performance. The average hashrate poolside was 27738 KHS and with it the expected payout for 24 hours of mining could get you around 0.05 BTC at the moment. So poolside we are actually getting a bit more than the 27 MHS promised by GAWMiners, though we are a bit short from the 28 MHS that Zeus claims for the THUNDER X3, but it is still acceptable. It is possible that with some tweaking that we can get slightly better results by lowering the HW error level. The quite high power usage of the miner however does not leave that much room for optimizing the cooling and squeezing some more MHz from the miner. We are not ready to give up, so stay tuned for more information as we continue to play around with the miner. It will be interesting to compare this miner with the A2-based 27 MHS mini miner that uses Innosilicon A2 Scrypt ASIC chips and we are hopefully soon be able to compare the two devices.